This article originally appeared in the winter/spring 2019 issue of The Twig, our member newsletter. To see more articles and past issues, click here. For serious birders, a rare bird sighting is treated with equal urgency as a fire alarm or an atomic bomb warning: everyone mobilizes. 0900 Hours: the birding email lists (to which multiple Sycamore staff members subscribe) sound an alarm, putting all Bloomington birders on high alert. 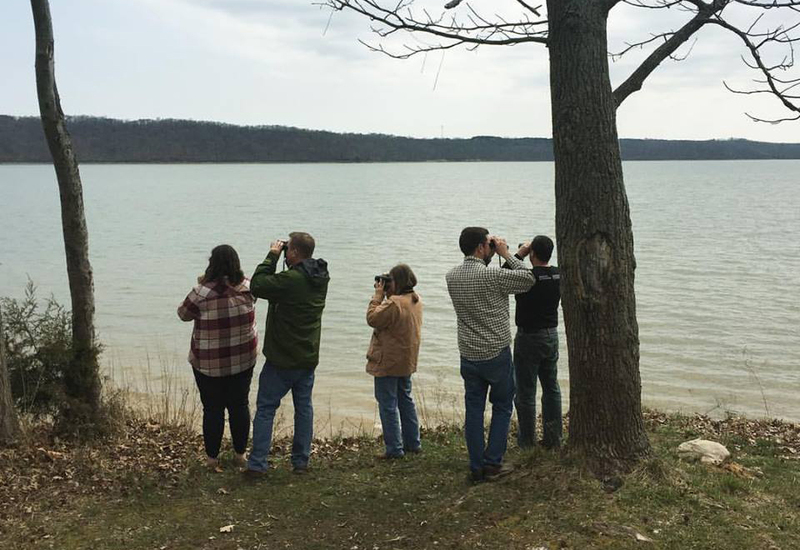 EARED GREBE SIGHTING AT LAKE MONROE! From my desk on the ground floor, I can hear my coworkers scrambling in their offices upstairs. They race down the stairs to try to convey the seriousness of this opportunity to those of us (myself) who would not know a grebe from a goose. It’s a rare occasion for an impromptu staff bonding experience. Fifteen minutes later, the entire staff is piled into cars with a bag of binoculars and a mission to see the elusive eared grebe. “Birds incoming from the east!” Eight binocular-clad heads snap right in time to watch a (grebeless) flock of birds gracefully land on the surface of the lake. For an hour, we watch the skies and the lake — switching banks, changing binoculars, and eagerly pointing to tiny black blobs bobbing on the water. To this day, it is unclear whether any of those blobs was actually the grebe in question. Despite my coworkers’ best efforts, I am still only a novice birder. In over two years at Sycamore I can only confidently identify pileated and red-bellied woodpeckers, nuthatches, chickadees, and wrens. I could now (supposedly) differentiate an eared grebe from a horned grebe, should the opportunity ever present itself. But in my time with this organization I have had the opportunity to help protect thousands of acres for these birds. Working here allowed me to experience first hand what I was learning in graduate classes at Indiana University about ecology, conservation, environmental law, and natural resource management. Importantly, it gave me the chance to work with, and learn from, a group of dedicated and passionate environmentalists, volunteers, and community members. Should a grebe ever make its way to Bloomington, I am confident that my coworkers at Sycamore and the Btown community will welcome it with the same warmth and generosity as they did for me. In December 2018, Shayna graduated from IU’s School of Public and Environmental Affairs with two masters’ degrees. Through her five semesters and two summers working for Sycamore, Shayna made an incredible impact here and will be missed dearly! Shayna, thank you for all your hard work and delicious baked goods. We wish you well in your new job as the Center for Conservation Innovation Coordinator at Defenders of Wildlife!